Ok, so this is a little embarrassing. 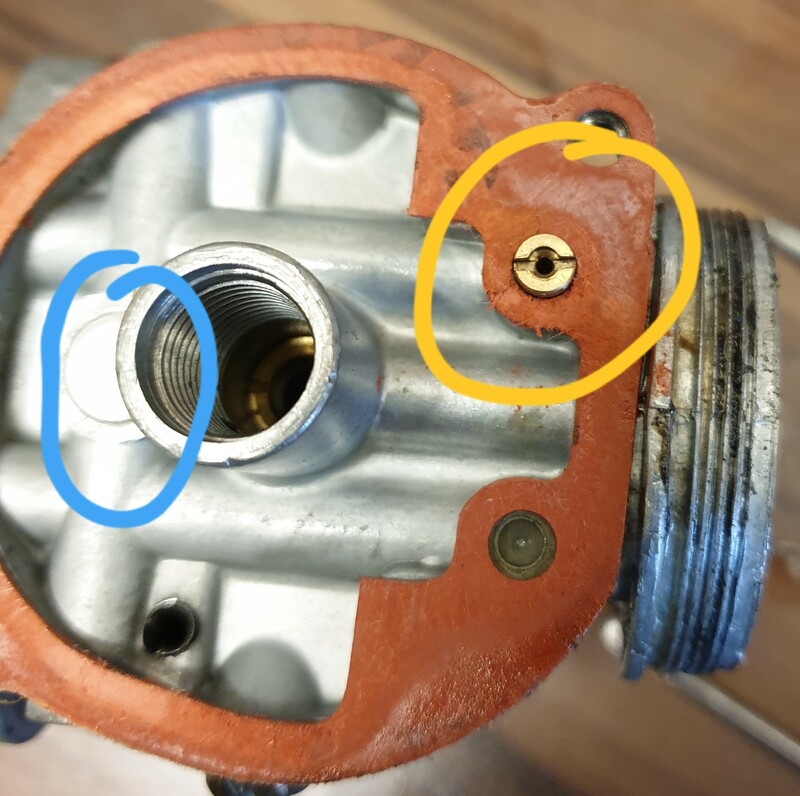 After 4 years of ownership and many carb strips, it might just be that I've been misled as to where the pilot bush is located on a properly fitted out B175 carb. Looking at the attached picture, I always thought the bush was pressed into the body, probably via the pilot screw hole, and ended up somewhere inside the blue circle I have expertly drawn. But from another post on this forum, ** Please log in to view ** it looks like it might be inside the yellow circle. The carb in the picture is not from my bike, it is from a friends B175. 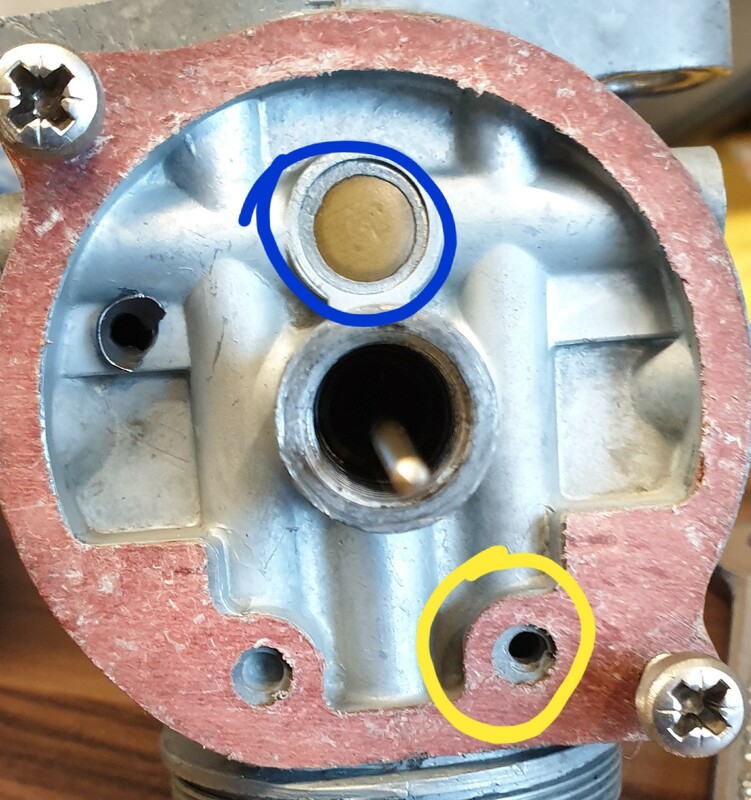 However, my own B175 carb has an empty threaded hole inside that yellow circle. So no jet at all. Maybe that's why it ran so badly with that carb? Perhaps neither of these carbs are originally from the B175s they are currently fitted too? Perhaps they are from earlier models that had the 2 stroke internals? Any insight gratefully received. Help me get this sorted in my head. Pilot circuit poorly designed as he points out. Thanks for that Blue. A useful video from Mr Henshaw. The picture attached here is my own carb, not the one in the original post. 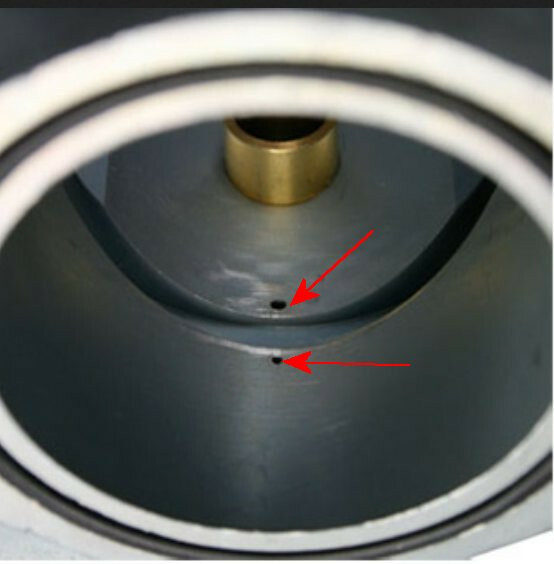 It looks to me as though it has the brass bush fixed pilot pushed in inside the blue circle. So if that is the fixed pilot, what is the hole in the yellow circle? The hole is threaded and the brass jet from the other carb screws in there nicely. It has the number 25 clearly stamped on its head, indicating that it is a pilot jet. Should my carb have this jet as well as the fixed pilot? I notice on Pauls video that his carb does not have one fitted. I am so confused here. Up until yesterday I would have discussed confidently how the pilot circuit works, but not now! If you do take yours apart Blue, I'd be very interested to see what you find in there. There are 2 different versions of Mk1 Concentric. Up to the D14 (2 stroke carb) they had a separate jet as shown in your original picture. The later B175 ones (4 stroke carb) were not fitted with this jet (although the hole was still threaded leading people to think that the jet was missing) but had a fixed size bush fitted just behind the pilot air screw adjuster. Although it is difficult, with a bright light you can see it if you remove the adjuster. The link in post 2 gives a good cutaway view of the system and the causes of problems. I managed to clean the passageways on mine out without resorting to drilling out the blanking plug using copper wire but it's not easy as the passageway has 2 right angle bends in it. Thanks for that Piquet. Have actually seen that cutaway diagram before, but that was a while ago so I'd forgotten how things went. I'll bookmark that page now. The open threaded hole leaves me a tad confused still. It says in the cutaway diagram that fuel is sucked in here from the float bowl. Does this not need to be regulated in any way? Or is the regulation done by the new fixed Bush? That would make sense I guess. I think this is slowly sinking in through my thick skull as I write! My carb (3rd post in this thread) is a 626/17 and definitely has the pressed bush pilot. I think I was just surprised to see the "additional" jet when I opened my friends carb (picture in original post). I didn't understand why his had that jet when mine did not. Assumed it was missing from mine, but now I know different. Mine is just positioned elsewhere. 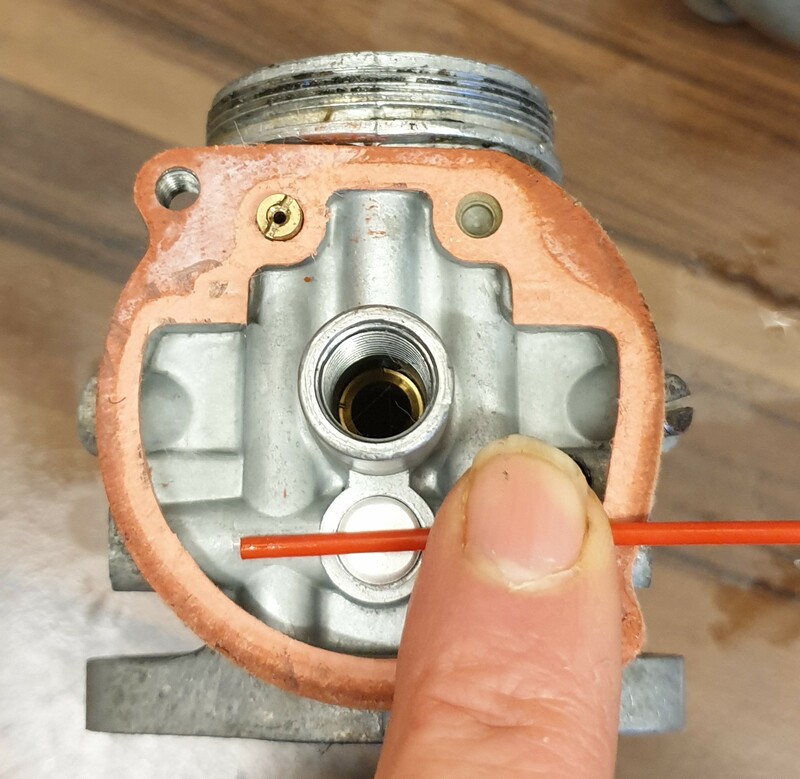 My friends carb is clearly an earlier variety without the pressed bush, as demonstrated in the attached picture using your drill method, albeit with a 2.15mm WD40 can extension pipe. So thanks for that tip, worked a treat. Thanks for that added information Mike. Those 2 holes are nice and clear. The carb, according to the previous owner is "quite new". I suspect his memory was a bit off, as the body, to me, looks "quite old"! At least I know what I'm dealing with now. I will be setting this carb up with 2 stroke internals. I have a friend that has the same carb with the screw in jet and it's running was much improved by inserting all 2 stroke parts. Can anyone help with identifying the carb parts in the attached pictures please? I've been on the Amal website and they use the same picture for every needle jet, same picture for every needle etc. I'm aiming to set this up as a 2 stroke carb. More out of curiosity than anything else. It already has the 2 stroke pilot jet as pictured in the original post. A 4 stroke jet holder (I think I need the shorter one). A 2 stroke needle (short with just one V groove). A 2 stroke needle jet (no hole drilled through hex). A 4 stroke spray tube. (Angled rather than flat). A dual purpose main jet. (Same for 2 and 4 stroke). but don't take my word for it, ID the parts yourself from the ** Please log in to view ** page on the Amal site linked to earlier. So only a slight difference of opinion between us. I always thought the angled spray tube was the 4 stroke version. Maybe someone else will come in on this one and help to clarify. The main jet may be an older style, (although I wasn't aware the style has changed), but it is definitely an Amal 180. It's clearly stamped. I will read the rebuilding article as you suggested. Hopefully there will be some good pictures for comparison. Wow, I'm outnumbered 2 to 1 now! When I first rebuilt one of these carbs about 4 years ago, I was told I needed the angled spray tube for the B175 4 stroke version. The info came from this forum. I've also just checked my new premier carb that was built as a 4 stroke version by Amal, and that has the angled spray tube. So I'm outnumbered, and now I need to check with Amal to see what they say. 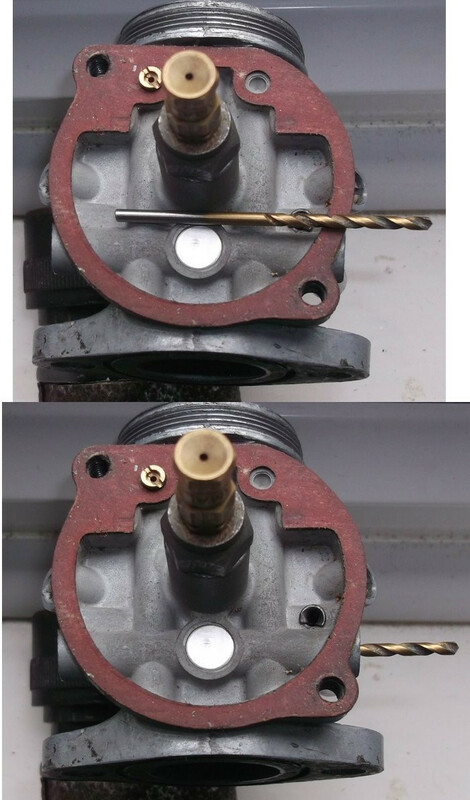 That's correct, although the B175 carb uses some parts usually specified for a 4 stroke (needle, needle jet and jet holder) it still uses the angled 2 stroke spray tube. That makes sense Piquet. Wondering if I read something about the spray tube at a similar time and got confused. So I'll get the proper jet holder as that seems to be the only wrong part now. Maybe the 4 stroke jet holder combined with the 2 stroke needle was why this bike was running poorly? Sorry Mick, I missed your post somehow. If I'd known I was 3-1 down I'd have conceded defeat even sooner! I think I'd be inclined to get a couple of different sized main jets to experiment with too. The main jet you have may be genuine, just old or it could, despite being marked Amal 180 be a non-genuine part as mentioned in the article. Thing is, with Amal parts, the items themselves are relatively inexpensive but the postage can be crippling on a single item, best to order what else you might need at the same time and the postage will be the same as a single item. That's a very good point. My friend (nickjaxe) runs a 160 main on his B175 with 2 stroke carb set up and says it works really well. I'll also get a new needle as the current one has a very old look about it, so maybe worn.